8:20pm The live feeds return from being blocked for the Head of Household competition. In the bedroom. Tom and Kato. Tom – three days ago all Ricky did was talk smack about Tamar. Tamar doesn’t know that. Kato – I’m not going to play that. They tried to play that with me. Tom – you’re not going to? Kato – No. Tom – yeah lets just have fun. Kato – I’m not going to hang out too much.. We have this room. I’ll come and say hi. There’s the high road .. and I’m on the high road. Tom – they were so happy though. Kato – they were scared. Tom – I almost feel good for them. Tom – good stuff again. I actually thought you were going to win it again there for a second. Kato – I did too. I did. And I had it … its a gut thing. It will actually be good to get out of here. Tom – oh yeah get me out of here. This is like being in jail. Probably worse actually. Kato – and they’re going to make it rough on us. Tom – yeah, yeah. We’ll just play cool and ignore them. Kato – I don’t think this is the spirit of the game .. but whatever. Tom – I think though .. the truth is be magnanimous, keep a positive attitude and it will be seen by the camera and that’s a good thing. It could end up being better that way.. The others join them. Kato – congrats guys! Bedroom – Tamar, Ricky, Dina, Natalie, Kandi and Lolo. Tamar – I DON’T KNOW BUT I WANT MY HOH IN HERE THOUGH! Ricky – it happened just the way it was supposed to. The person that won, was supposed to. Tamar – it DID! Thank you Ricky! Ricky hugs and congratulates Tamar on winning HOH. Ricky – Nomination Ceremony is about to be LIT! Natalie – ITS ABOUT TO BE LIT!!! Dina – but what about now. Natalie – now were going to go win the veto. Tamar – they sent all of us home in their head already. JOEY!!! WE DID IT BOY!! 9pm Kato and Tom playing pool. Tom – so are we lobbying for who gets to go first? Is that fun? No its funner if it looks like we want to win right? 9:05pm Lounge room. Natalie and Lolo. Natalie – Tom is such a poor sport. We need to win the veto so that neither one of them.. (Kato & Tom) even if one of them won.. they can only save themselves. It is such a good win for us. 11:40pm Kandi and Dina playing pool. Dina is freestyle rapping. Dina “check the taps and we will see who’s the snake. Who are the snakes!” Kato from the kitchen – I’m not a snake. Kato comes up to Dina – Are you serious about the snake line!? I have to know. When I told you everything in the train room… now its all over .. I’m out of here. You’re saying I’m a snake?! Dina – no. Kato – you know they’re going to work you out right?! Dina – they think I’m with you guys. Kato – with us!? You don’t talk to us. Are you crazy!? I told you everything. I protected you. You’re still here right!? You think that’s a coincidence?! Kato – well you know I’m out of here. Dina – I don’t know anything. Bathroom. Tom and Kato. Tom – we should both bring our packed bags to the nomination ceremony and then as soon as we’re nominated …race for the door and see if we can open it. Let me out of here! Me first. 12:06am – 12:20am Tamar gets her HOH room.. They all check out her photos, basket and Tamar reads her HOH letter. 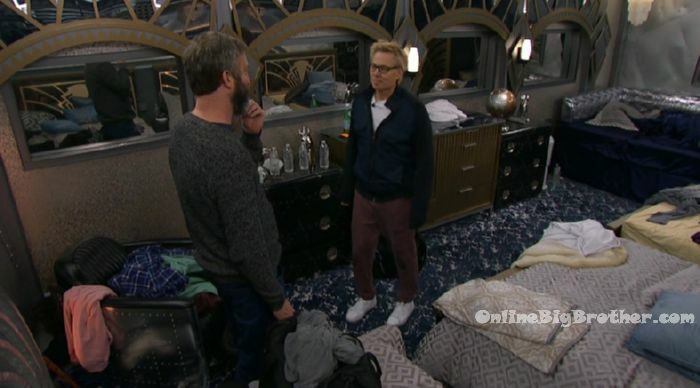 Kato and Tom put in their time and then head out of the HOH room. 12:36am HOH room. Tamar, Ricky, Kandi, Natalie, Lolo and Dina. Tamar – so what do we do now? Ricky – enjoy our time. And we enjoy tomorrow. Tamar – I don’t know what I’m going to say now because I don’t want to be mean. Natalie – don’t be mean. Dina – speak from your heart. Natalie – its just one of those things. I don’t think anyone should be maliciously mean to anybody however they show their true selves in their actions .. I mean they were all mad and salty because you didn’t come up to the HOH room because you feel asleep. They left… they didn’t even want to be in here. So how are you going to be upset about something but then if someone else won you don’t.. you know what I’m saying? Ricky – you don’t have to be mean but I think its important to be honest. Natalie – because he was direct as f**k with you. Ricky – he went over board.. Big Brother blocks the feeds. Dina – my brother says be firm but fair. 12:41am Big Brother blocks the feeds..
1:40am – 1:50am The live feeds return. HOH room. Kandi, Tamar, Ricky, Natalie and Dina. Kandi talks about how she got a reality shows and going on tour. I feel like god had been working on me. Previous Celebrity Big Brother Eviction results.. WHOA! Tom talking to live feeder..or POP. Here’s the thing with Tom. He’s delusional. He talks about Tamar …that she should keep him and Kato. Because the others are strong players. BUT..he and kato have won almost everythiing. In fact Kato just missed this HOH by a second. That all Tom has been doing is making it fun. No Tom. Paranoia..talking 5,000 and more scenarios is not fun. Tom seems to be immersed in how America sees him. So..now Tom is back and forth that they will pull the rabbit out of the hat..or they’re going on the block. But..if you block what Tom is saying…and see his eyes…he’s as nervous and worried as a person came be. I mean..it’s a bit sad really. His mantra is FUN, FUN< FUN. But he's not making it fun. I just hope that they all have success from the show. That would be good for all of them. Cheers. I’ll agree; Tom is alot. I’m watching just the TV show and After Dark. But these arguments have been elevated EVERY time by Lolo or Tamar. And they are being jerks. One of my pet peeves is “Love wins every time” when it comes from hateful people. Love is loving the unlovable (which is different perspective for everyone). Dina is two faced from what I just watched. Kandy and her at least are being nice to the guys but this crap from Ricky is so childish. He just came up and fist pumped Tom but the bad energy is coming from those girls. I started out a huge Lolo fan; loved her in the olympics. Now I can’t stand her. God bless Kato for listening to all of Tom’s scenarios. I couldn’t do it. But that doesn’t make him an evil guy. His “over analyzation” is NOT “defcon”. I personally can’t stand detailitis. But Ricky and the 3 girls are blowing EVERY thing out of proportion. Over that entire room. I’m even over Natalie now. Send Tom home and then send Lolo home. No question Lolo and Ricki are awful. There is no need for the personal. And Ricki is always coming out with spiteful remarks. Tom bothers me though with his spinning things. He doesn’t take ownership for his mess ups. In saying that he’s a nice guy. This game brings out the best or worst of a person. Kato is a nice guy and really wants to win this. Tom still comes out with some really funny things..but this came is not for everyone. Dina is 2 faced. When she was drunk last night…well..in vino veritas. Tamar. Now she;s upset because she isn’t grateful enough that she was saved. Sigh. In any event…I’ll bet dollars to donuts that production has a twist in store to save one of tomatoes. That Kandi isn’t grateful enough. Man the spin is real, right? Kandi is smart and knows what to expect out of Tamar. I use to think the production thing was conspiracy theories but I still can’t wrap my mind around Tamar getting that power. It must be something about the isolation and taking away your normal support peeps that makes people blow and lose all perspective. Nat and Lolo have completely rewritten history for themselves. I think it’s interesting that the celebrities aren’t isolated after exiting the house. Cameras are a funny thing. You get what you pay for…..this is a free site after all…..and with Kraken consumption I’m surprised there isn’t more mistakes. You learn to read through them over the seasons. You try listening and typing at the same time trying to keep up with the conversation and seeing who said what using what slang you can’t even figure out. Once you do it for an hour then come back and complain. Does it really matter how the name is spelled on here, Ahebea? Tom does have a point in regards to Tamar keeping him and Kato bc they are strong players and have a shot of winning HOH again, and who would they target? Loco, Ricky and Natalie. But once Tom and Kato are gone, who do you think Loco, Ricky and Natalie will target? TAMAR. And that might even happen sooner with the way Tamar and Loco are constantly popping off!!! Bottom line is, paranoia got the best of Tom and that is not unusual when you’re the HOH and a secret power comes into play! All I want is Lolo evicted. She has a short fuse which is giving me a short attention span on watching this show. Playing scenarios (not the Jozea kind, but actual). for argument’s sake, let’s say Tamar takes the path of least resistance and nominates Tom and Kato. 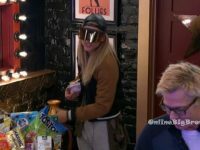 Is there an alternative reality that has both still in the house after the eviction. Would we want that? 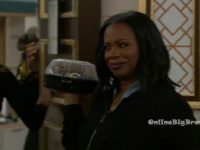 if Tom or Kato wins veto and removes either… would Tamar have a fire in her belly (depending on the way the wind moved at that second) to nominate one of the trio? if one from tomkato, and one from rickyloconem were on the block after veto: Kandi and Dina would control the vote. There is a strong possibility they’d vote out the trio member to cut that to a duo. if veto not used: my assumption is Kato evicted for some reason. if one of the trio won veto they wouldn’t use it. if Kandi or Dina won veto and used it the possibility exists that the other of the two could be replacement or one of the trio could be the replacement. if Kandi or Dina is replacement nom, Tom or Kato still goes home, and Tamar limits her options to being bottom of the totem pole with the trio. The missing data: is Tamar more tied to being the fourth in a four person alliance (wasn’t she already booted from that group once)? or more tied to being in the proposed three person alliance with Dina and Kandi? additionally, would Tamar ever figure that Tom and Kato are so concerned with optics and production discussions of the last two days, that if both were to stay, they’d be too scared to nominate Tamar because of the racism can of worms being reopened? hmm. any thoughts or projections? I was hoping she did not win this hoh because now she cannot use her power it ends this round. But still will have popcorn to see what goes down. We thought last week was full of turbulence. This week will set a record, for sure. Get ready for a very bumpy ride. Tamar winning HOH is great! Tamar is going to make some tomato soup! Do you really think she’s going to be interesting? I mean she’s been so meek and mild this whole time that I forget she’s there most of the time. SHe might do something random. It’ll be interesting to see what she does, I think she has issues with everyone. It’s odd to think Kandi might just be the safest this week. Simon you are right. It’s good that Tamar won hoh. Here’s hoping Lolo is sent out. Loved how Joey imitated her when interviewed by Julie after eviction. They had some good people on here. Now there gone. All that’s left are,well enough said!!!!!!!! Once again, a twist at the beginning started this. If Jon was safe and never on the block the first week, this would be a totally different game. I wanted Joey to stay. Kato and Tom felt like he was the strongest player but he never won a veto or HOH. See those two were the strongest. Tamar, you never know which way she is going to go. I know my mind has changed about Tom. I wish CBS would have shown him bullying the girls. He had extreme HOHitis. Celebrities are just as sloppy as the regular houseguest. Watched Kandi go into the store room, open the pack of clean towels. Took one out then went to shower. Why not take the package and put them up? She is going to the bathroom anyway. This is one crazy season! Joey a strong player? He wasn’t in the area of competition, but he WAS with the two jury votes thus far being in his favor. Tomato felt Ricky was the strongest potential competition and wanted him gone (Tom never trusted Ricky). Rapids started once the girls felt they were being controlled by Tomato (which I completely understood, although many don’t seem to feel the same way). Lolo and Natalie Marie turned the tide on Tomato because they knew it was in their best interest to keep Ricky (no one would vote for Ricky in the end). Tom’s mistake was forming an alliance with the girls and then trying to control them. 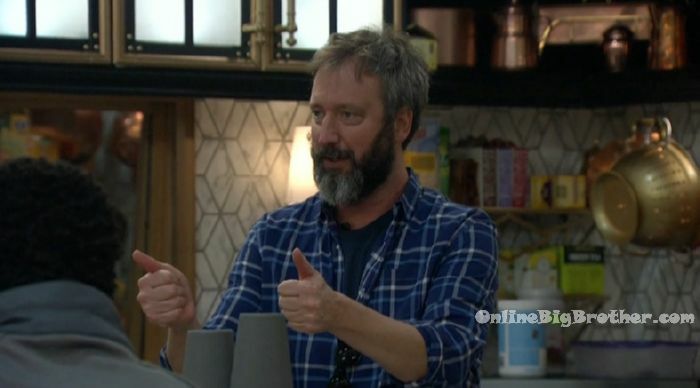 Tom also got way too confident as HOH and his interview tactics felt like waterboarding. I still like Tom, but I can’t stand Kato. Talk about a phoney. He is as fake as it gets. 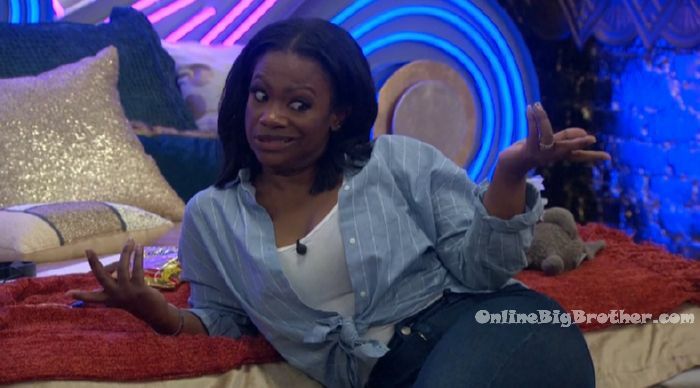 This whole Tamar winning POP and HOH is sketchy to me. I’m not buying it. She will take her sweet time with everything (ex: stringing production along today when they called her for nom ceremony… multiple times “I need 3 minutes” which really means 30). She loves the cameras being on her 24/7. She is reality tv gold….easy drama….someone people love to hate. As of now, my favorite to win this game is Natalie Marie. She is not making enemies in the house and has held her composure rather well in stressful situations. Tom became obsessed with who had the power and questioned the other houseguest repeatedly. That is what initially did him in. 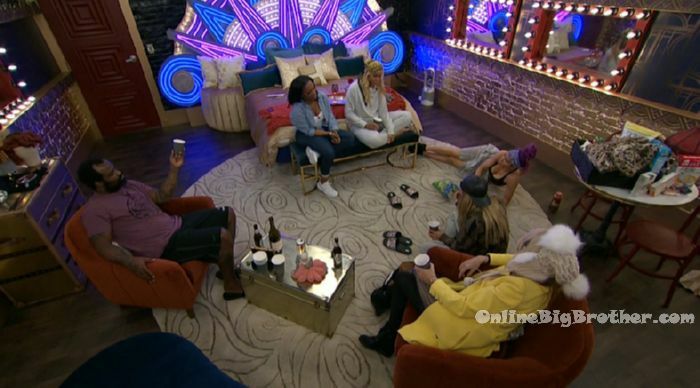 The second thing was to fill the girls in on his plan before the veto. This made Lolo and Eva Marie fight harder for the veto. Eva Marie is not as nice as what is being projected. Maybe she said all those nice things above but fir the most part she has been just as bad as Ricky and Lolo bashing everyone else including Tamar. If Eva Marie is final 2 with Lolo, I can see her winning but not against anyone else. Ricky just likes to stir the pot. Kandi is trying to keep the peace but it doesn’t make the Gold Room happy. Tom and Kato both gotta go.. I’m telling you.. trust me..